A self-extracting file is a bit like a safe. You can store all your valuable documents within it using just one password. A self-extracting file is a type of file that contains other files that have been encrypted. The self-extracting file contains within it the software needed to unpack the file and decrypt all the files contained within it. The end user, therefore, does not need any special software to execute the file. Only the correct password is needed. 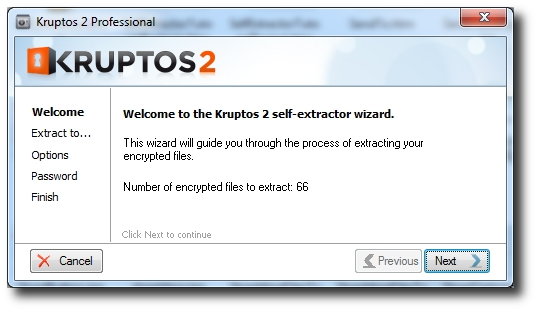 Self-extracting files are the perfect way to send your encrypted files to other people who do not have Kruptos 2 installed on their computers. Once they have the Self-Extracting file all they need is the correct password. 2. Select the files\foldes you would like to add to the Self-Extracting file.